Hainan is the largest island of the Indo-Burma Biodiversity Hotspot and has the best preserved and most extensive tropical forests in China (Deng et al. ; Zang and Ding ). The island harbors the Hainan Island Monsoon Rain Forest Ecoregion, one of the 26 terrestrial habitats of China internationally recognized by the World Wildlife Fund for its global ecological importance (Francisco-Ortega et al. ). A recent study on distribution of endangered species in China identifies southern Hainan as one of eight hotspots for plant conservation in the country (Zhang and Ma ). In Hainan eight species of Begonia, four of which endemic (B. hainanensis Chun & F. Chun, B. howii Merr. & Chun, B. peltatifolia H.L. Li, and B. sublongipes Y.M. Shui) to the island, were documented (Gu et al. ). In continuation of our studies of Asian Begonia (e.g., Chung et al., ; Hughes et al. ; Nakamura et al. ; Peng et al. ; Rubite et al. : Begonia chingipengii [sect. Baryandra, Begoniaceae], a new species from Luzon Island, Philippines, submitted), we report the discovery of an additional undescribed species, B. wuzhishanensis, endemic to the island. Somatic chromosomes of the new species, Begonia wuzhishanensis (Ku & Jin 2093) were examined using root tips. The methods of pretreatment, fixation and staining for chromosome observations followed Peng et al. (). Classification of the chromosome complements based on centromere position at mitotic metaphase follows Levan et al. (). Voucher specimens have been deposited in Herbarium, Biodiversity Research Center, Academia Sinica, Taipei (HAST). A fresh leaf of Begonia wuzhishanensis (Ku & Jin 2093) was dissected and attached to a stub. The samples were frozen with liquid nitrogen slush, then transferred to a sample preparation chamber at −160°C and etched for 15 min at −85°C. After etching, the temperature reached −130°C for sample fracturing and coating. After coating, the samples were transferred to the SEM chamber and observed at −160°C with a cryo scanning electron microscope (FEI Quanta 200 SEM/Quorum Cryo System PP2000TR FEI). Begonia wuzhishanensis C.-I Peng, X.H. Jin & S.M. Ku, sp. nov. (sect. Diploclinium) —TYPE: CHINA, Hainan Province, Wuzhishan City, Fanyang Township, Nanyi Village, on wet, mossy rocky slope by a stream in forest, elev. ca. 180 m, 18°52'53"N, 109°20'33"E, 10 October 2009. Type specimens pressed from plants brought back from the field and cultivated in the experimental greenhouse, Academia Sinica, Taiwan, 3 December 2013. Shin-Ming Ku & Xiao-Hua Jin 2093 (holotype: HAST; isotype: PE). 五指山秋海棠 Figures 1 and 2. Begonia wuzhishanensis C.-I Peng, X.H. Jin & S.M. Ku. A, Habit; B1, Leaf adaxial surface; B2, Leaf abaxial surface; C, Stipule; D, Bract; E1, Staminate flower, side view E2, Staminate flower, face view; F, Androecium; G1, Carpellate flower, side view; G2, Carpellate flower, face view; H, Style and stigmas; I, Capsule. All from Ku & Jin 2093 (HAST). Begonia wuzhishanensis C.-I Peng, X.H. Jin & S.M. Ku. A, Habit, leaf showing iridescence; B, Inflorescence; C, Elongate tuber (arrow); D, Erect stem; E, Stipules; F, Bracts; G, Leaf adaxial surface; H, Leaf abaxial surface; I, Male flower, face view; J, Male flower, side view; K, Female flower, face view; L, Female flower, side view; M, Cross-section of ovary; N, Plant with subterranean, branched, elongate tubers (arrow); O, Vegetative propagation. All from Ku & Jin 2093 (HAST). Herbs, monoecious, deciduous perennial, with elongate tubers. 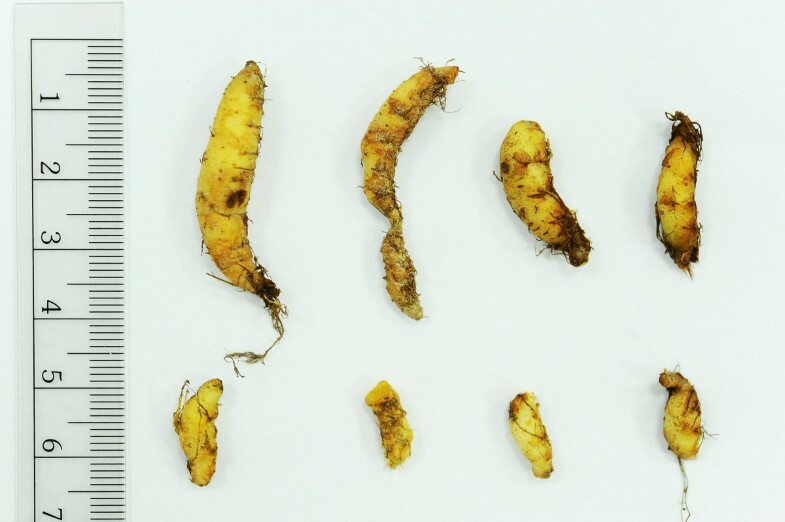 Tubers prostrate on soil surface or underground, to 7 cm long, 0.9 cm across, branched or unbranched. Stems erect, succulent, 0.3–0.5 cm across, to 20 (−25) cm high at anthesis, branched from lower nodes. Leaves alternate, petioles 2.5–4 cm long, 0.4 cm across; stipules triangular, margin fimbriate; leaf blade nearly symmetric, cordate, 3.5–8 cm long, 3–7.5 cm wide, chartaceous, adaxial surface green, slightly bullate, hirtellous, venation dark green and impressed, iridescent; leaf abaxial surface pale, veins reddish or red, manifestly elevated and hirtellous, margin irregularly double-serrate. Inflorescences axillary, dichasial cymes branched 2–3 times, peduncle 10–18 cm long, ca. 0.3 cm in diameter, hirtellous; lower bracts ovate, ca. 0.5 cm long, 0.3 cm wide, margin fimbriate, abaxially densely hirtellous, eventually deciduous. Staminate flower: pedicel sparingly hirtellous to nearly glabrous, 2–4 cm long, tepals 4, pinkish, outer 2 broadly ovate, ca. 1 cm long, 0.8 cm wide, abaxially glabrous to hirtellous, inner 2 lanceolate, ca. 0.8 cm long, 0.4 cm wide, glabrous; androecium zygomorphic, ca. 0.3 cm across; stamens ca. 25–30; filaments free, 0.1–0.2 cm long; anthers 2-locular, obovoid. Carpellate flower: pedicel sparingly hirtellous to subglabrous, 1.3–1.6 cm long, tepals 3, outer 2 broadly ovate to suborbicular, ca. 0.8 cm long, 0.8 cm wide, inner 1 lanceolate, ca. 0.6 cm long, 0.4 cm wide; ovary trigonous-ellipsoid, ca. 0.7 cm long, 0.5 cm across, white, glabrous, 3-winged, 3-locular; placentas septal; styles 3. Capsule nodding, ca. 1.6 cm long, 1.2 cm wide, wings unequal, triangular, abaxial wing ca. 1.2 cm tall, lateral wings ca. 0.4 cm tall, styles persistent. CHINA. Hainan Province, Wuzhishan City, Fanyang, in forest, elev. ca. 200–500 m, 15 October 2003, Xiao-Hua Jin 5208; ca. 300–500 m, 20 October 2003, Xiao-Hua Jin 5284 (PE). Somatic chromosomes at metaphase of B. wuzhishanensis (Ku & Jin 2093, HAST) were determined to be 2n = 26 (Figure 3). The 26 chromosomes gradually varied from ca. 1.0 to 2.0 μm long in length. A pair of the longest chromosomes has centromeres at submedian; several chromosomes at median, however, those of smaller chromosomes could not be determined. Satellites were not observed. 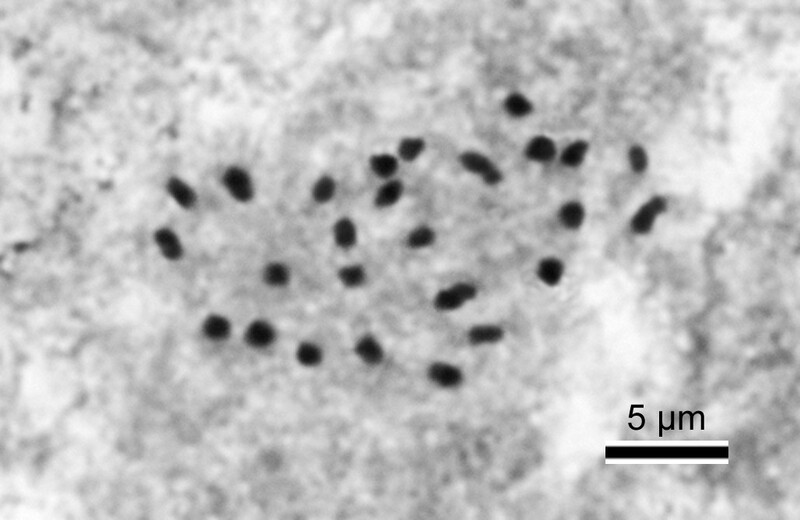 Somatic chromosomes at metaphase of B. wuzhishanensis (2 n = 26, from Ku & Jin 2093 , HAST). 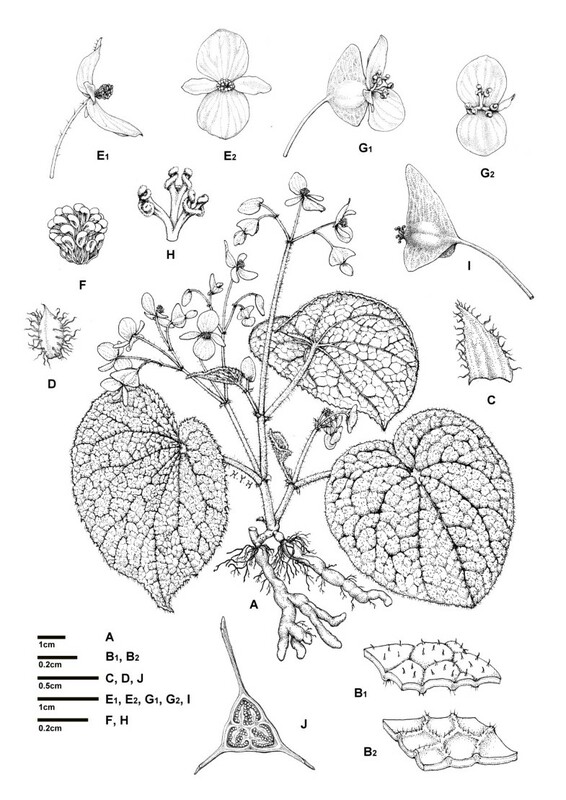 Begonia wuzhishanensis belongs to the heterogeneous section Diploclinium, which comprises ca. 130 species (Doorenbos et al. ; Hughes and Pullan ). To our knowledge, 16 species of the section were cytologically studied. They exhibited a wide variation of chromosome numbers as 2n = 22, 24, 26, 28, 30, 32, 36, 38, 46, 52, 82. Somatic chromosome number of 2n = 26 was previously reported in two species: B. acaulis Merr. & L.M. Perry (Papua New Guinea, Legro and Doorenbos ) and B. grandis Dryand. (China and Japan, Nakata et al. ). Adaxial surface with scarce multiseriate trichomes (Figure 4A); cross section ca. 220 μm thick, epidermis single-layered on both surfaces, hypodermis absent, palisade tissue and spongy tissue both single-layered (Figure 4B); abaxial surface with multiseriate trichomes on nerves, stomata complex single, helicocytic, nearly flat (Figure 4C,D). 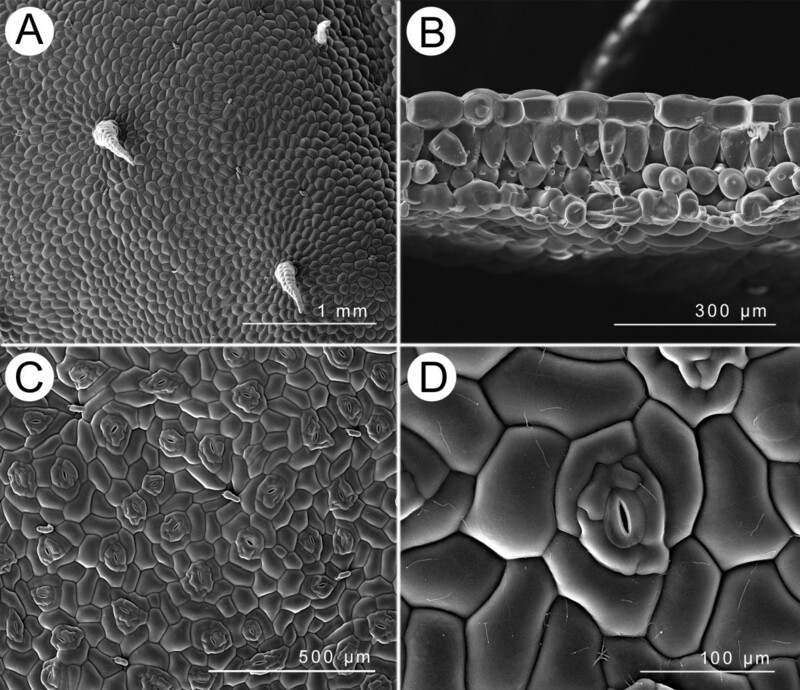 Leaf SEM microphotographs of B. wuzhishanensis . A, Adaxial surfaces; B, Cross section; C, Abaxial surfaces; D, Stomata complex. Wuzhishan (1,876 m), located in the center of Hainan, is the highest mountain on the island. Begonia wuzhishanensis is a rare species found at lower part (ca. 200–500 m altitude) of Wuzhishan (Figure 5). It occurs on wet mossy rocks by streams in tropical forest. 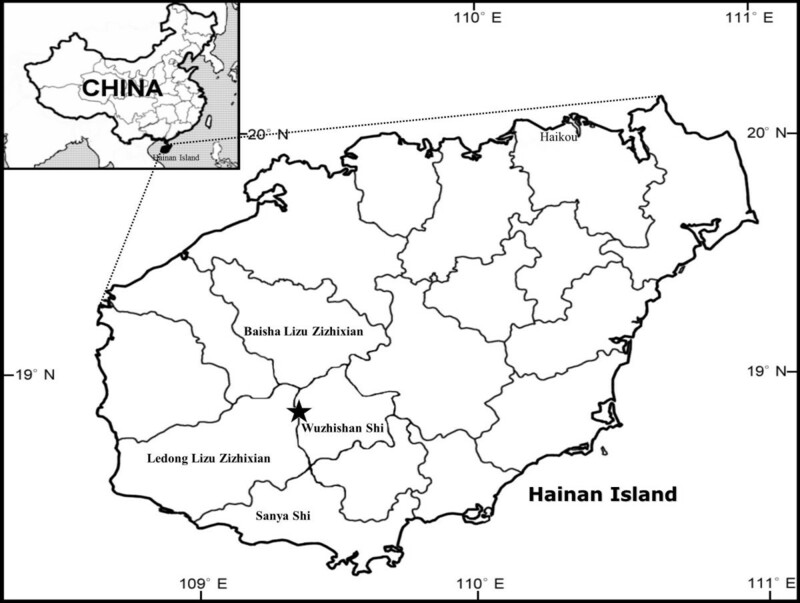 Distribution of Begonia wuzhishanensis (★) in Hainan Island. The specific epithet is derived from the type locality, Wuzhishan ('Five-fingered Mountain', literally) of Hainan Island, China. Flowering from August to December; fruiting from October to December. Begonia wuzhishanensis can be grown from seeds. Alternatively, they can be propagated by the elongate tubers or leaf cuttings with ease (Figure 2O). Begonia wuzhishanensis has prominent elongate tubers that are rarely encountered in the genus. This feature resembles those observed in B. lithophila C.Y. Wu (sect. Reichenheimia; Li ) from Yunnan, China and B. woodii Merr. (sect. Baryandra) from Palawan, the Philippines (Figure 6). The perennating tubers of B. woodii have been erroneously interpreted as short rhizomes in the past (Merrill ; Hughes et al. ). Elongate tubers of Begonia woodii Merr. (Philippines, Palawan, Taytay, Lake Danao, Peng 23479 , HAST). Placentation of B. wuzhishanensis is noteworthy: its ovary is 3-locular with 2 placentas each growing from middle of the septa (Figures 1J, 2M, 7B). Such placentation was classified as 'septal' in African Begonia (Figure 7; Reitsma ). Septal placentation was also observed in part of the ovary of some species in the Asian sect. Coelocentrum (e.g. B. aurantiflora; C.-I Peng, Yan Liu & S.M. Ku, Peng et al. : Figure one; B. bamaensis; Yan Liu & C.-I Peng, Liu et al. : Figure one; B. ×breviscapa;C.-I Peng, Yan Liu & S.M. Ku, Peng et al. : Figure one; B. debaoensis;C.-I Peng, Yan Liu & S.M. Ku, Ku et al. : Figure one; B. semiparietalis;Yan Liu, S.M. Ku & C.-I Peng, Ku et al. : Figure nine). With 3-locular ovaries, bifid placentas and perennating tubers, etc. but without axile placentation in B. wuzhishanenis (Figure 7B), we have tentatively placed it in the polymorphic and 'dust-bin' sect. Diploclinium (Rubite et al. ). Further molecular phylogenetic studies to clarify its placement are underway. Placentations. A. Typical axile placentation (Begonia ravenii C.-I Peng & Y.K. Chen, sect. Diploclinium); B. Septal placentation (B. wuzhishanensis); C. Schematic drawing of septal placentation (adopted from Reitsma, : Figure 1D). Begonia wuzhishanensis somewhat resembles B. obsolescens Irmsch. and B. fimbristipula Hance. Comparison of salient features of the three species is provided in Table 1. 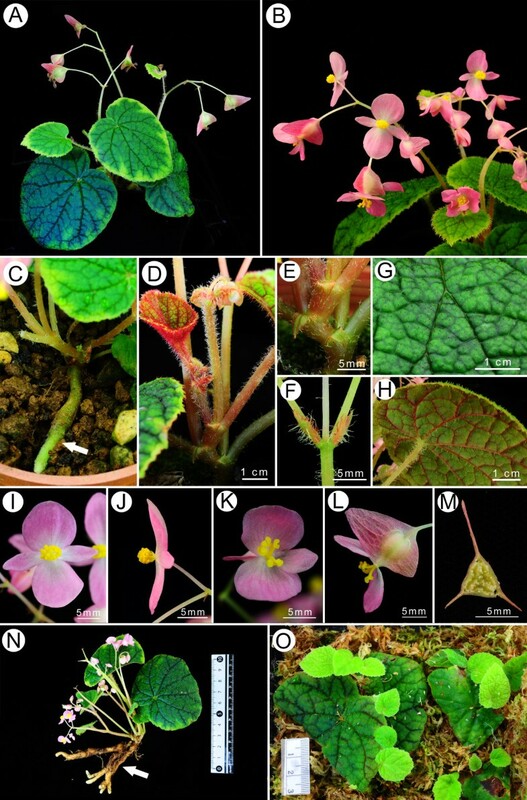 A careful study of literature, herbarium specimens and living plants, both in the wild and in cultivation, support the recognition of the new species Begonia wuzhishanensis. It is currently known only from Fanyang, Wuzhishan Mountain in the center of Hainan island, China. Begonia wuzhishanensis is unique in having elongate tubers and septal placentation. It is tentatively assigned to sect. Diploclinium. Further studies to clarify its phylogenetic position are underway. We thank Ms. Victoria McMichael, serials librarian of the Missouri Botanical Garden for providing useful references. This study was supported in part by grants from National Science Council and Academia Sinica, Taiwan to Ching-I Peng (HAST). CIP discovered the new species from PE herbarium, brought living materials into cultivation, and prepared the final version of the manuscript; SMK, guided by XHJ, collected living plants from the field and prepared the distribution map; HAY carried out morphological studies, prepared the color plate, and drafted earlier versions of the manuscript; YK carried out the cytological study; HYH assisted with morphological studies and prepared the line drawing; XHJ collected the new species in 2003 and 2009, and provided field data. All authors read and approved the final manuscript.